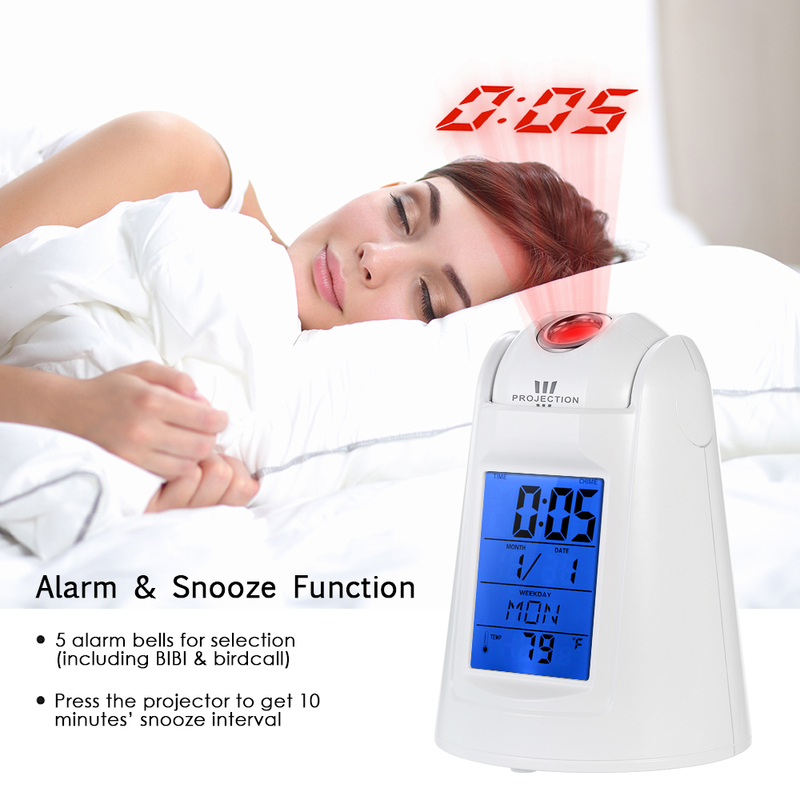 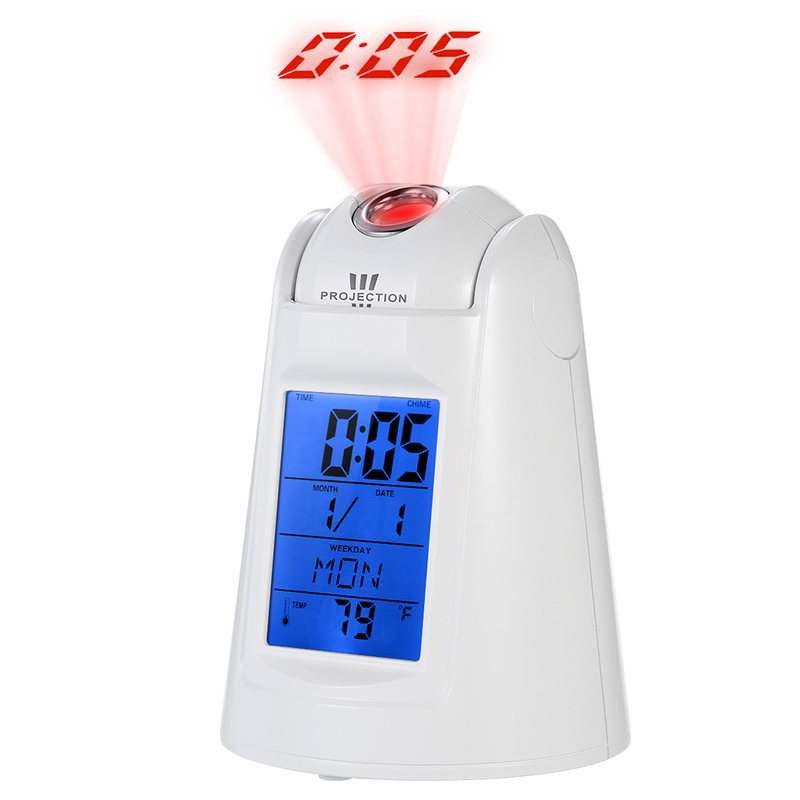 No need to twist around, you can check the time easily with this ceiling projection alarm clock, especially when you are lying in bed. 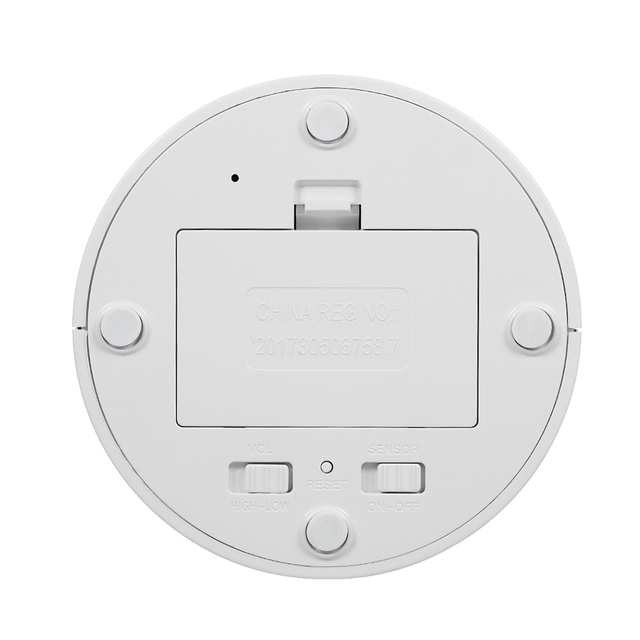 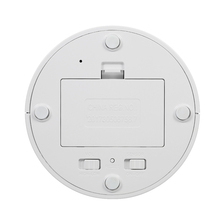 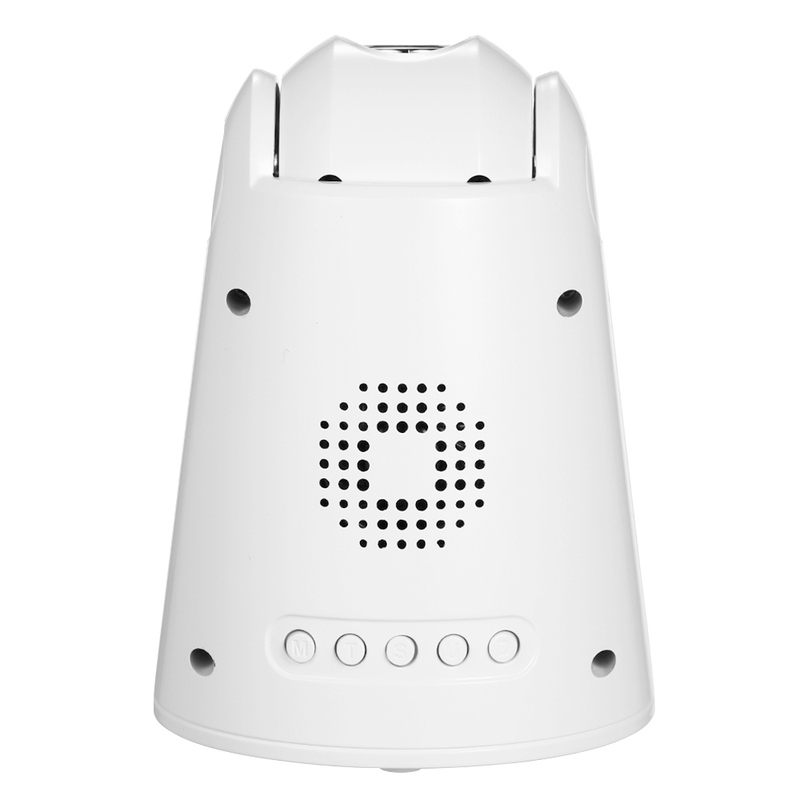 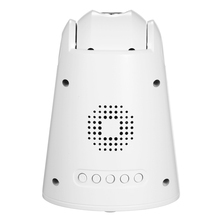 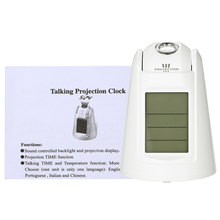 In addition, it has hourly chime function, which can remind you of important things to do. 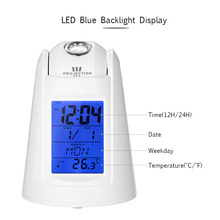 LED Backlight Display: LED screen, with blue backlight, displays time(12H/24H), date, weekday and temperature(°C/°F). HD Time Projection: the projector on the top, with adjustable angle, can project time on the ceiling, which enables you to see the time conveniently especially when you’re lying in bed. 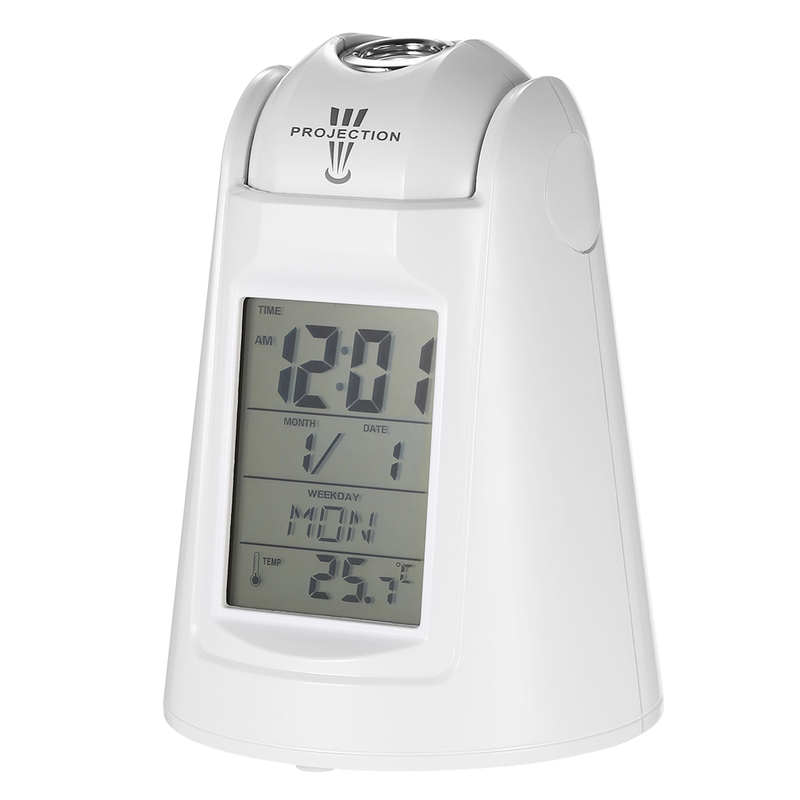 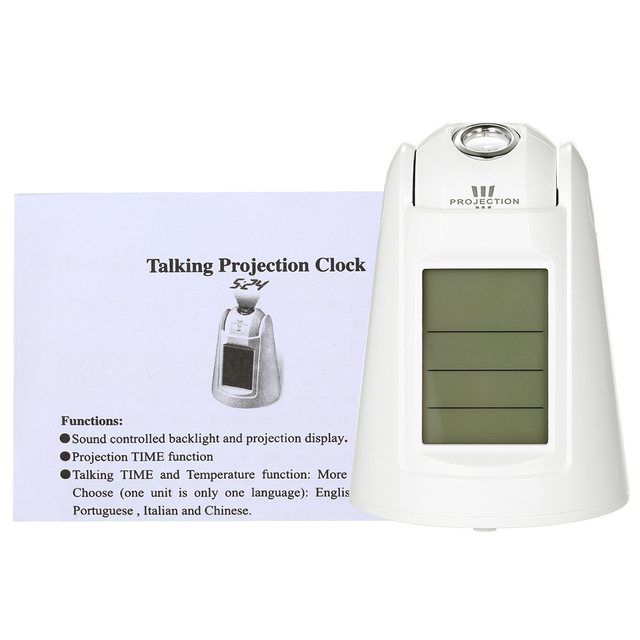 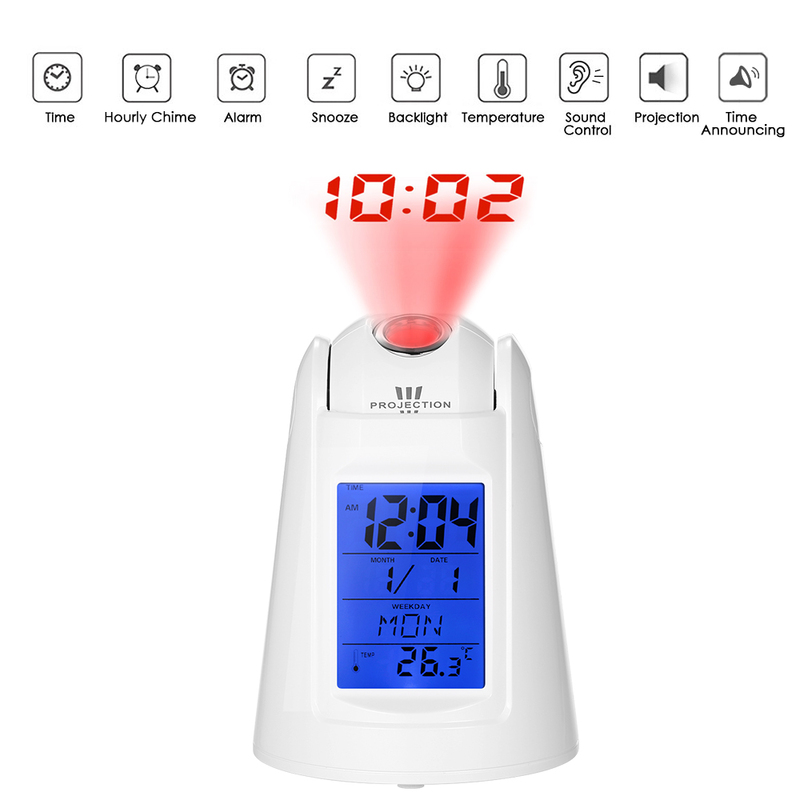 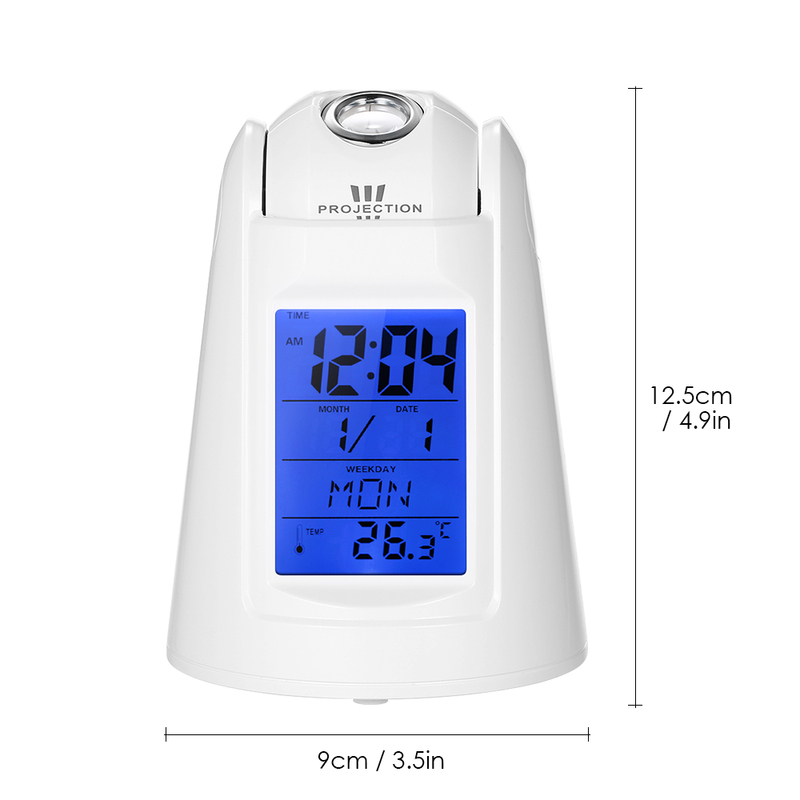 Time Announcing Function: each time you press the projector, it can tell the time and temperature at present in English. High/Low volume adjustable. Hourly Chime: it will automatically tell the integer time & temperature in English (it won’t chime during 22:00-6:00). You can manually turn off this function. 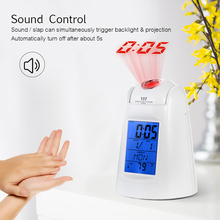 Sound Control: the sound or slap can simultaneously trigger backlight and projection function, and they will automatically turn off after about 5s. 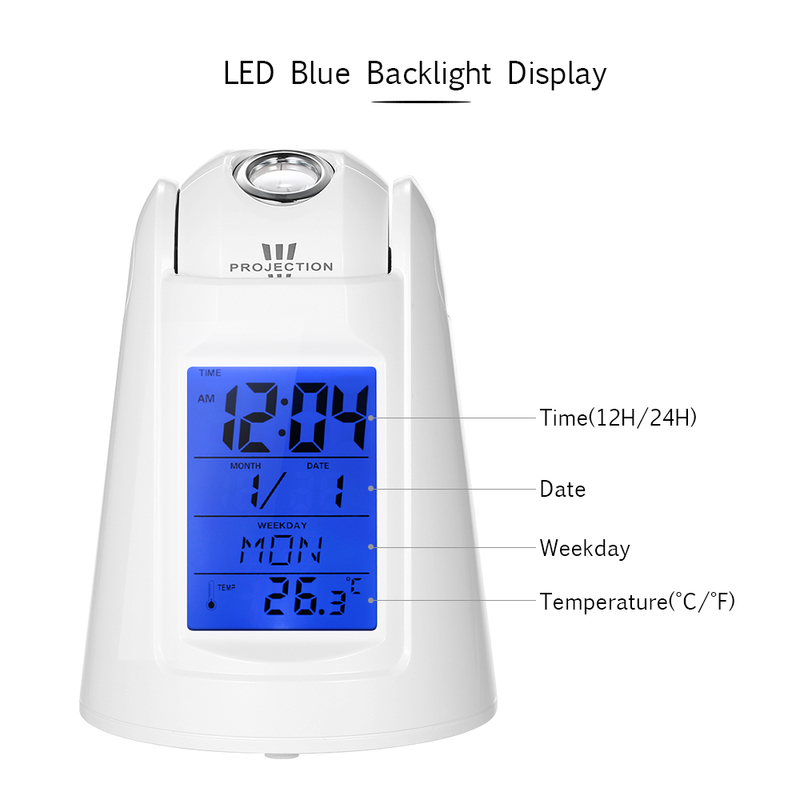 This function can be turned off. 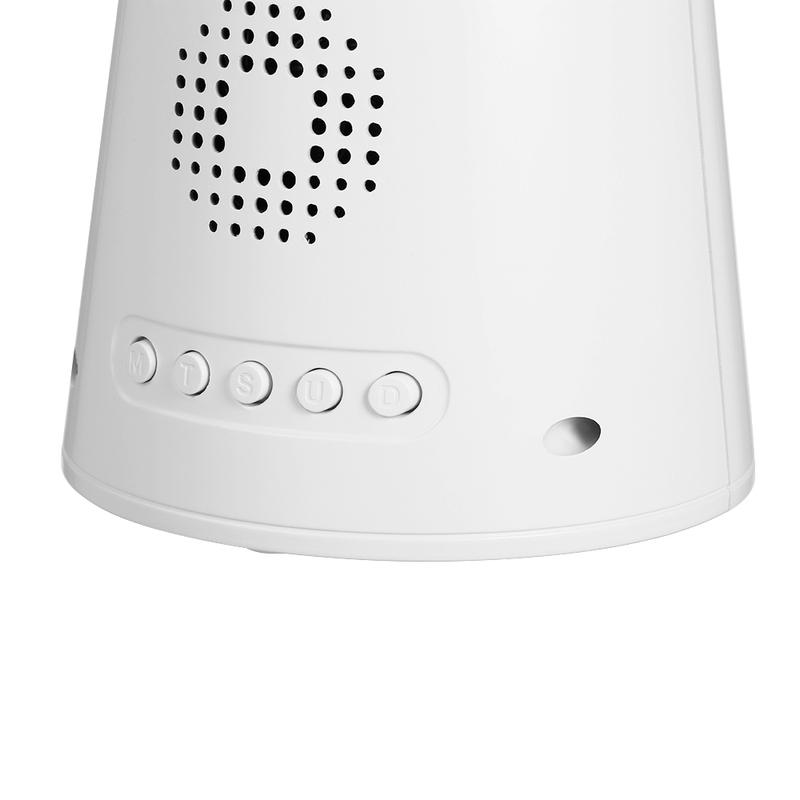 Alarm Function: designed with one alarm, 5 alarm bells for selection(including BIBI & birdcall), it will ring for 1 minute and automatically stops if there’s no operation. 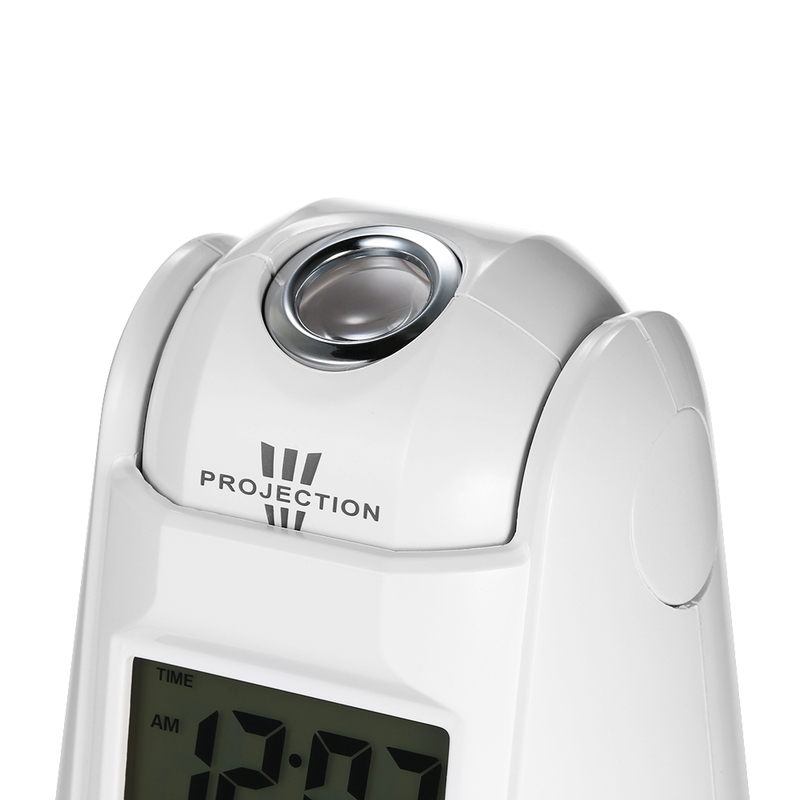 Snooze Function: when the alarm rings, press the projector to enter snooze mode. 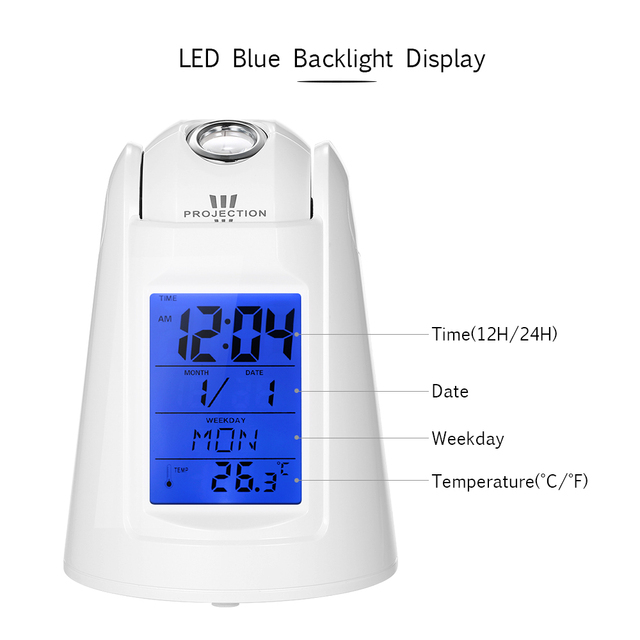 It will ring again every 10 minutes to utmost 6 times, meanwhile the backlight and projection will be triggered, and then tell time and temperature. 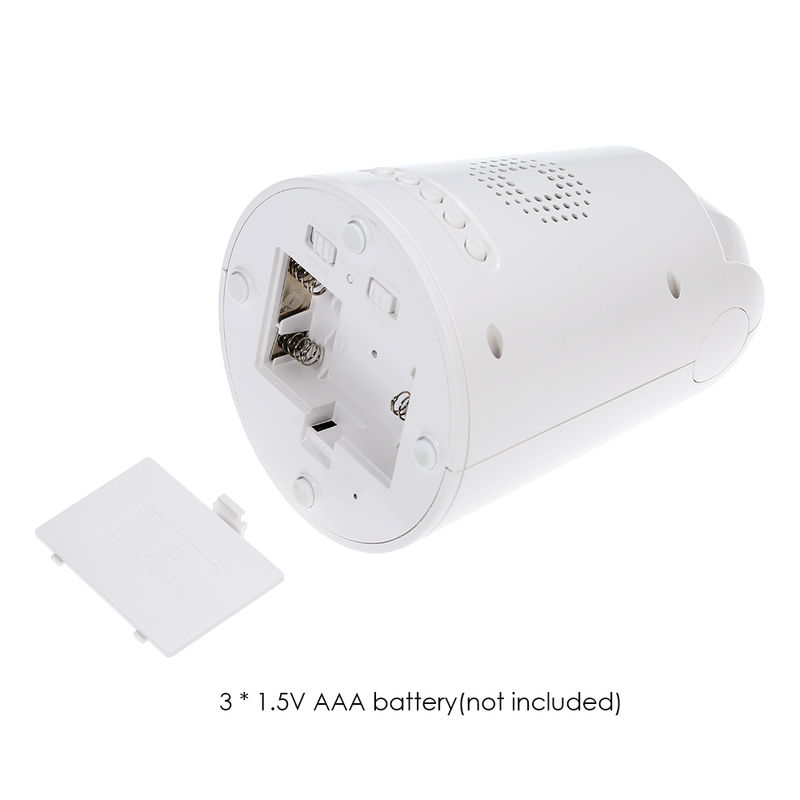 Power Supply: powered by 3 * 1.5V AAA batteries(not included).